Check out this instant win game by Planters. All you have to do is visit the contest page here, enter your email, register, and play the game. Ends September 25, 2013 good luck! One (1) Grand Prize: Treadmill Desk Station. ARV: $728.99. Three (3) First Prizes: Kickboard USA: Micro-Luggage Scooter. ARV: $249.99. 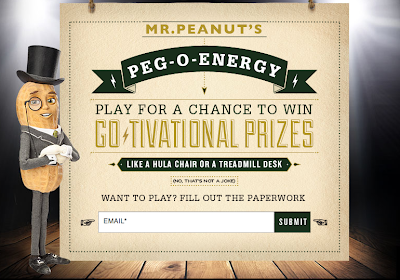 Five (5) Second Prizes: Hawaii Exercise Chair. ARV: $299.99. Ten (10) Third Prizes: Meriwether of Montana: Handcrafted Wooden Hiking Stick. ARV: $95.00. Twenty (20) Fourth Prizes: Eton: Boost Turbine 2000 Smartphone Charger. ARV: $59.99. Five thousand (5,000) Fifth Prizes: 5 count box of Planters Sustaining Energy Mix. ARV: $6.99. Total approximate value of all prizes is $40,078.71.